A whitewashed room containing little more than an unclothed mannequin in a distractingly come hither pose seems like a fitting place for to be meeting Marple’s arch pop aesthetes Dutch Uncles – a band whose reputation for visual flair and musical mischief precedes them. 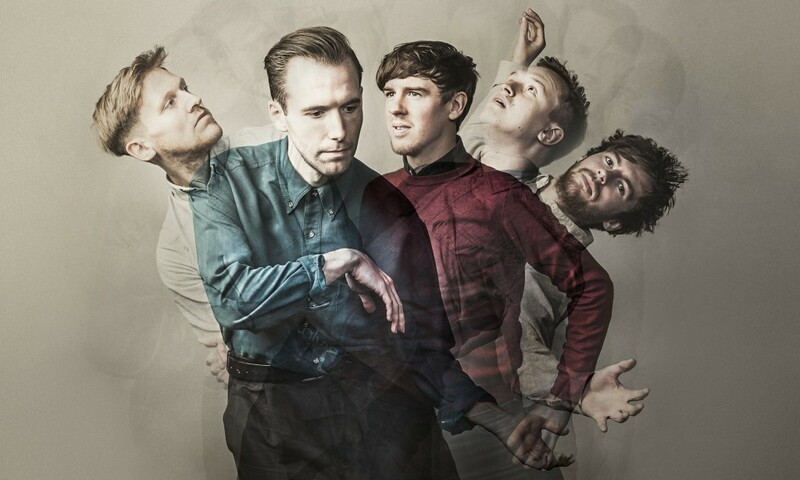 Irresistible to A & R men from outset, Dutch Uncles were picked up in 2008 by German label Tapete for a one-album deal just three months after their first gig in Manchester. Since then, they’ve toured with The Futureheads , remixed Bombay Bicycle Club and scored a management deal with local label Love and Disaster, who put out ‘The Ink’ – a strikingly packaged seven inch reminiscent of classic XTC. In summer of last year, the band recorded a World Cup song – a multi-layered a cappella in which the individual names of the England squad are repeated in time signatures dictated by their shirt numbers. To further boggle the mind, each player’s name is panned to a stereo position within the track that corresponds to his actual position on the playing field. The song, entitled Fabio Capello (whose name does not feature), made it onto NME radio within ten minutes of being mastered, and sounds like Laurie Anderson presenting Match of the Day. It’s perhaps no surprise, then, that a band as musically obdurate and inventive as this would eventually be courted by Memphis Industries, one of the hottest indie labels in the land, and home to fellow math-poppers Field Music, with whom the band feel a close musical kinship. Listening to the new album, Cadenza, which evokes the sonic playfulness and ambition of band like Sparks and King Crimson, it’s obvious that the band are keen to fly in the face of the traditional meat-and-potato Manchester lad-rock sound. In fact, bending avant-garde disciplines into fun pop shapes could be described as their raison d’etre. On the track X-O the band have replayed movements from minimalist composer Steve Reich’s Electric Counterpoint. A daring cover, if ever there was one. Having just come back from a tour with joyful noise mongers Young British Artists, and boasting firm friendships with the likes of Everything Everything and Delphic, do Dutch Uncles think that a new Manchester scene, unfettered by the past, is emerging? This spirit of collaboration and co-operation has undoubtedly played a part in Dutch Uncles’ rapid evolution. Robin describes the Love and Disaster label as “like extended family”. The band are also keen to big up local graphic design collective Dr. Me, who have given the Cadenza album its unique physical identity. So how keen are the band to crossover into the pop mainstream? Would they, for example, play Top of the Pops, should its rumoured return come into fruition? As the rest of the band arrive for the photo shoot and begin grabbing Ms Mannequin in inappropriate places, talk turns to their most treasured albums. Duncan eventually chooses Television’s Adventure whilst Robin goes for Discipline by King Crimson. Adventure and Discipline. Seems appropriate. The Dutch Uncles manifesto. Originally written under the pseudonym Harper Hay.